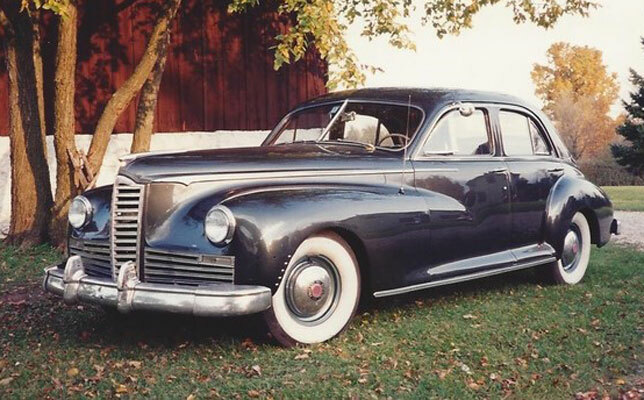 The DEAL of the DAY on the internet is a 1947 Packard Super Clipper from Wisconsin. When the Cars-On-Line.com newsletter was published today they announced this week’s DEAL of the DAY on the internet as they do each week. This vintage classic car is both rare and is considered a “Full Classic” by the Classic Car Club of America. Here is a 1947 Packard Super Clipper which the seller says has just 82k miles on it. (See more detailed photos in the ad.) He indicates it has been certified by the CCCA as a “Full Classic” which is no small honor. It is a very unique and a rare car to find. Only two post-war models like it have been certified. This is one of the Packard models which was designed by Dutch Darrin. It has a 356 ci engine with 9 main bearings (biggest production engine in ’46 and ’47.) It even has a smooth shifting 3-speed transmission with overdrive. The seller says it runs smooth and quiet at interstate speeds. There is a 5th shock absorber on the rear axle for extra ride stability. The Cardinal Grey is an original factory color. Sheet metal is all solid, straight and original. Note that this car has electric windshield wipers, a premium option for that time. Yet, it is our DEAL of the DAY for Sunday because the asking price is only $11,900. The DEAL of the DAY preview gives you first shot at all the cars that will be highlighted in the DEAL of the DAY feature on the Cars On Line home page. Often these cars sell in the newsletter before they even make it to the home page! You’ll always see them here first though. For a preview of all the DEALs of the DAY for the coming week follow this link to today’s COL newsletter.